Three-layer Kentucky jam cake is a regional specialty, made throughout the year, especially at Christmas. Instead of spreading the seedless blackberry jam between the cake layers, it is incorporated into the cake batter along with a variety of spices, nuts, and dried fruit. 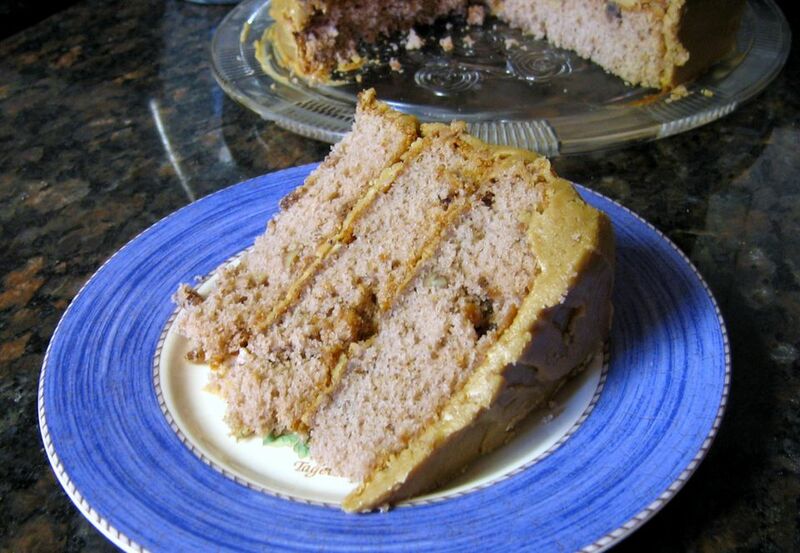 The moist, sweet, and tangy cake is layered and covered with a delicious caramel frosting. A cream cheese frosting would be wonderful on the cake as well, adding an extra richness. Although now a Southern treat, the recipe originally was brought over by German immigrants who first settled in Pennsylvania and then migrated to Kentucky, Tennessee, and Ohio. Recipes feature nuts that grow locally like pecans and walnuts; this recipe incorporates pecans into the batter but feel free to also add to the top of the cake if you like. Preheat oven to 325 F. Grease and flour 3 round 8- to 9-inch cake pans. With an electric mixer, cream the butter and the sugar until light. Add eggs, one at a time, beating well after each addition. In a separate bowl, combine the flour, soda, salt, and spices; add to the creamed mixture alternately with buttermilk; beating well after each addition. Blend in the jam, chopped pecans, and raisins or dates. Pour into the prepared cake pans, dividing the mixture evenly. Bake for 35 to 40 minutes, or until a cake tester or wooden pick comes out clean when inserted in center. Cool in pans on racks for 15 minutes. Carefully invert onto racks to cool completely. Frost with caramel frosting or cream cheese frosting. Feel free to decorate the top with additional nuts. The spices are meant to create a warmth in the cake and not necessarily stand out; however, if you prefer it to taste more like a spice cake, you can increase the amounts. Just do this slowly and taste the batter as you go since too much spice will overwhelm the flavor (and can't be removed!). It is important to alternate the dry ingredients with the buttermilk to achieve a batter with the right consistency. If you add the liquid all at once, the batter will become too wet and can separate; if the dry ingredients are dumped in altogether, the batter can become thick and may cause overmixing, resulting in a tough, dense cake. Begin with a portion of the dry ingredients, alternate with the wet, and finish with the dry ingredients. Not every blackberry jam will work in this recipe. It used to be said that if you did not use homemade jam the fruit would sink to the bottom of the cake pan. This is not true, but if you use a jam with extra pectin it will turn the cake rock hard so choose something that is as close to natural as possible.